The Treatment of Wrist Fractures (and an earlier return to function). The wrist is made up of eight small bones and the two forearm bones, the radius and ulna (see Figure 1). Its anatomic design permits an extraordinary freedom of movement in multiple directions. The shape of the bones allows the wrist to bend and straighten, move side-to-side, and rotate, as in twisting the palm up or down. Fractures of the wrist are common, representing about a quarter of all fractures involving the limbs. Of these, three quarters of wrist injuries are fractures of the distal radius and ulna. The eight carpal bones are injured less frequently. Early accurate diagnosis and timely delivery of the correct treatment helps to avoid long-term loss of function. Wrist fractures occur in all age groups. A fracture may occur in any of these bones when they are subjected to a forceful injury such as when falling down onto an outstretched hand. They occur in paediatric patients from falls and playground accidents; and in young adults due to sports injuries, motor vehicular or work related accidents, or falls from a height. They often occur in older patients from seemingly minor falls, due to a background of osteoporosis, a common condition in which the bone becomes more brittle, making them more susceptible to fractures. The most commonly broken bone of the wrist is the radius. When the wrist is broken, there is pain, swelling, and decreased use of the hand and wrist. Often the wrist appears crooked and deformed. Fractures of the small wrist bones, such as the scaphoid, are unlikely to appear deformed. In simple fractures, the bone fragments remain in normal alignment and are stable. 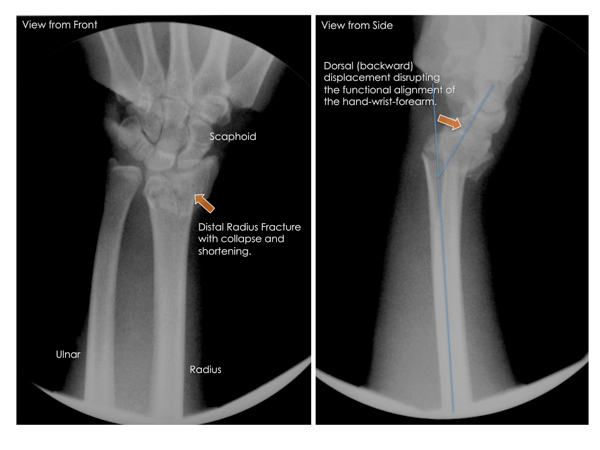 Other fractures have bone fragments that are displaced or are unstable, tending to shift; in which case the wrist is more likely to appear crooked. Some fractures break the smooth joint surface and this increases the risk of cartilage degeneration (arthritis) if uncorrected. Sometimes the bone is shattered into many pieces making it unstable. An open (compound) fracture occurs when a bone fragment breaks through the skin and this carries in an infection risk. A good clinical examination and simple X-rays are often sufficient to confirm the presence of a fracture and help determine treatment. Occasionally, a CT scan or MRI may be required to better visualise the fracture fragments and associated injuries. In addition to the bone, ligaments (the structures that hold the bones together), tendons, muscles, and nerves may be injured as well when the wrist is broken; and these injuries may require additional treatment as well. 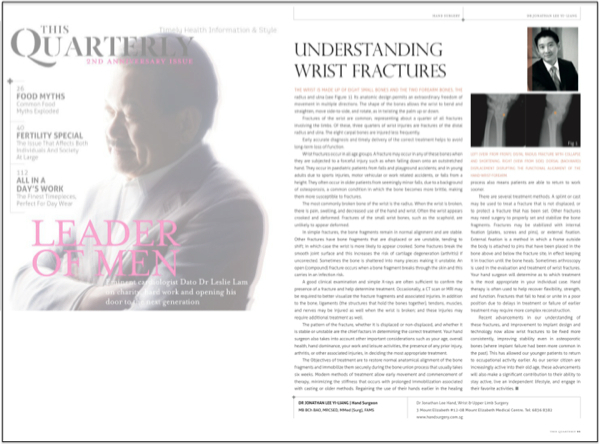 The pattern of the fracture, whether it is displaced or non-displaced, and whether it is stable or unstable are the chief factors in determining the correct treatment. Your hand surgeon also takes into account other important considerations such as your age, overall health, hand dominance, your work and leisure activities, the presence of any prior injury, arthritis, or other associated injuries, in deciding the most appropriate treatment. The Objectives of treatment are to restore normal anatomical alignment of the bone fragments and immobilise them securely during the bone union process that usually takes 6 weeks. Modern methods of treatment allow early movement and commencement of therapy, minimising the stiffness that occurs with prolonged immobilisation associated with casting or older methods. Regaining the use of their hands earlier in the healing process also means patients are able to return to work sooner. There are several treatment methods. A splint or cast may be used to treat a fracture that is not displaced, or to protect a fracture that has been set. Other fractures may need surgery to properly set and stabilise the bone fragments. Fractures may be stabilised with internal fixation (plates, screws and pins), or external fixation. External fixation is a method in which a frame outside the body is attached to pins that have been placed in the bone above and below the fracture site, in effect keeping it in traction until the bone heals. Sometimes arthroscopy is used in the evaluation and treatment of wrist fractures. Your hand surgeon will determine as to which treatment is the most appropriate in your individual case. Hand therapy is often used to help recover flexibility, strength, and function. Fractures that fail to heal or unite in a poor position due to delays in treatment or failure of earlier treatment may require more complex reconstruction. 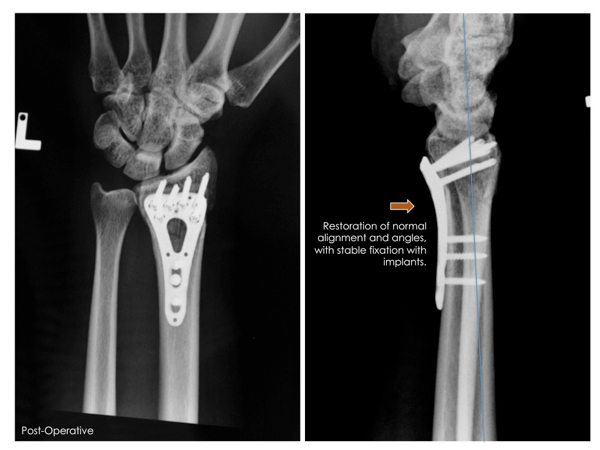 Figure 2: Distal Radius Fracture after restoration of normal alignment, correction of deformity, and internal fixation with locking titanium implants. Recent advancements in our understanding of these fractures, and improvement to implant design and technology now allow wrist fractures to be fixed more consistently, improving stability even in osteoporotic bones (where implant failure had been more common in the past). This has allowed our younger patients to return to occupational activity earlier. As our senior citizen are increasingly active into their old age, these advancements will also make a significant contribution to their ability to stay active, live an independent lifestyle, and engage in their favourite activities.